You are here: Home / Family & Traditions / Let’s hear it for Canada! Let’s hear it for Canada! 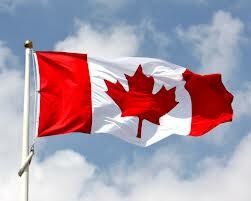 July 1st is Canada Day, celebrating the anniversary of Canada’s confederation. The Constitution Act of 1867 joined Nova Scotia, New Brunswick and the Canada province (now Ontario and Quebec) into one country, granting Canada a substantial amount of independence from England. Not until 1982 did Canada become a completely independent country though, and this was also the year the national holiday was made official and the celebrations became even more important. Several major happenings have taken place on July 1st: The first national radio hookup in 1927, the first cross-country television broadcast in 1958, the first colour television transmission in 1966, the inauguration of the Order of Canada (Canada’s second highest honour for merit) in 1967, and “O Canada” became the official national anthem on Canada Day in 1980. The most tricky thing about this recipe is to find a cedar plank – or a plank you can replace it with (hickory, maple…) – because grilled on such a plank, which has been soaked in water for 1/2 to 24 hours, the salmon will get a nice smoky taste. But actually, it’s not tricky at all, you’ll get them at Amazon (Räucherbretter Zedernholz on .de /cedar grilling plank on .co.uk / planche à barbecue bois de cèdre on .fr). Place the salmon on the soaked plate. Whisk together maple syrup, mustard, salt and pepper; brush half over salmon. Place plank on grill over medium-high heat, close lid and cook, brushing once with the remaining glaze, until fish flakes easily when tested, 20 to 25 minutes. Or bake it in the oven, 220°C for about 12 min. Halve salmon lengthwise and cut crosswise into 6 slices. Happy fishing, happy barbecuing & happy Canda Day!